Almost every SSD you can buy today is great, but some are better than others. If you need to buy a SATA SSD today, we still suggest the 500 GB Samsung 850 EVO—even two years after it launched. The 850 EVO is not the fastest SATA SSD you can get, but it comes close. More important, it has one of the best combinations of price, performance, and capacity of any drive you can buy. And it’s available in 2.5-inch, mSATA, and M.2 SATA form factors, so it’ll work with almost every computer. You should get an SSD like the 500 GB Samsung 850 EVO if you have a computer that is one to three years old and has a traditional hard drive or a cramped, outdated SSD. But this rule applies only if you plan to keep your computer for at least another year or if you know you can bring your SSD to your next computer. Frankly, if your computer already has an SSD, the only real reason to get a different SSD is if you run out of room on the first one. You’ll never notice a speed difference between two different SATA SSDs unless you’re writing huge files every single day and you care about a few seconds’ worth of improvement. Before you buy, it’s important to figure out what kind of SSD fits your computer. Most computers still support 2.5-inch SATA drives like our pick, but these drives are becoming less common in high-end laptops as they’re replaced by M.2 SATA and PCIe SSDs. Almost all desktop computers still support 2.5-inch SATA, and many newer ones also have M.2 support. mSATA was common in laptops a few years ago, but isn’t in new computers. This gets confusing, so head to our full guide for a complete breakdown. To check compatibility on your laptop, check your manufacturer’s website or use Crucial’s upgrade advisor tools to figure out what drive type your computer uses, and whether you can replace the drive. Be aware that some laptops—recent MacBooks, to be precise—use proprietary form factors that may make it difficult or impossible to perform a DIY upgrade. Though some older (mostly pre-2013) MacBooks can be upgraded, many newer Airs and Pros cannot. Still others can, but only with specialized, expensive drives from just a couple manufacturers. As such, this guide is mostly aimed at non-Mac users. Ultimately, it’s hard to get a bad SSD; you could buy almost any drive and not end up disappointed. But it’s possible to spend more money than you need to, or to not get a fast enough SSD for the price. When shopping for a drive, make sure you’re getting the right type; many of the newer models come in both 2.5-inch SATA and M.2 SATA form factors. If we were upgrading a laptop or buying the primary drive for a desktop without an M.2 PCIe slot, we’d get the 500 GB Samsung 850 EVO (also available in M.2 SATA and mSATA form factors). The 850 EVO is fast, cheap, and consistent, and it comes from a company that makes its own SSD controllers, firmware, and NAND. That means it gets first dibs on the good stuff, and is able to design the entire SSD to work together from the start. Samsung has made some of the best SSDs for the past five hardware generations, and this one is no exception. The 850 EVO isn’t the cheapest great SSD, but it is the best cheap SSD, even two years after launch. It offers a great combination of price, performance, and capacity, plus ample write endurance, hardware encryption support, and an exceptionally long five-year warranty. The 850 EVO uses Samsung’s 3D TLC NAND, so it has a much higher write-endurance rating than its predecessor, the 840 EVO. The 500 GB version is rated for 150 TB of writes, which is still competitive against most newer SATA drives. In real life, all SSDs should easily write many times that; wearing out an SSD before the drive itself becomes obsolete is almost impossible. 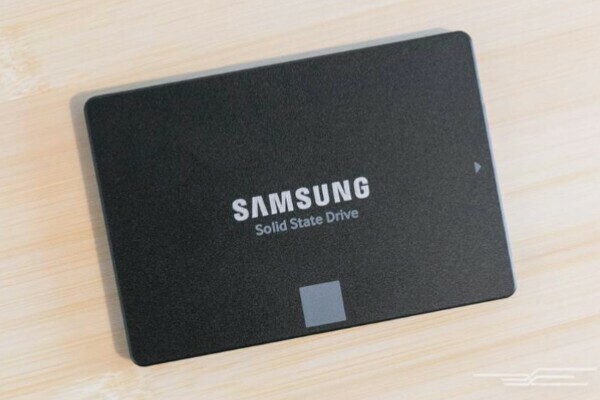 If the Samsung 850 EVO is too expensive or you want a 1 TB drive, get the Crucial MX300. The 525 GB MX300 is typically about 25 percent cheaper than the 500 GB 850 EVO, and the 1 TB version is around 20 percent cheaper than the Samsung equivalent. The Samsung still has the slightest edge for its speed, warranty, and consistency, but the Crucial MX300 is a very, very close second place. When comparing drives of the same capacity, the MX300 is slightly slower than the 850 EVO in most benchmarks. In part, this is because Samsung uses better, more expensive components, like an eight-channel controller and more NAND modules for better parallelization. But the MX300 has Dynamic Write Acceleration, a caching solution similar to Samsung’s TurboWrite, which creates a large buffer that significantly boosts the drive’s write speeds. For most people, the speed differences will be indistinguishable. If you make your living in a field like video editing or 3D modeling and need a drive that can move large files around very quickly, consider the Samsung 960 Pro. Benchmarks show that this M.2 PCIe SSD writes four times faster and reads up to seven times faster than the best SATA SSDs, like the 850 EVO and 850 Pro. It’s overkill for most people; the average user won’t ever notice the difference between this and our main picks, and shouldn’t spend the extra $150-plus. But if you do need the extra speed of a M.2 PCIe SSD, the Samsung 960 Pro is the fastest one you can get, with high write-endurance ratings and a solid five-year warranty.